As the birthplace of the skyscraper and the center of many of the technological and aesthetic innovations in the field, Chicago still remains an architectural encyclopedia of modernity. Chicago has enjoyed several construction booms ever since the dramatic rebirth that ensued after the Great Chicago Fire at the end of the 19th century. The disaster allowed the city to improve, providing an almost blank canvas for talented artists and professionals. The so-called “best generation of Chicagoans” produced not only the skyscraper, but it also pushed Chicago to the forefront of architecture. The second boom happened decades later, around the 1950s and 60s, as the country’s economy picked up after WWII. During this period the city saw the rise of other great talents and iconic high-rises. Bruce Graham and Fazlur Kahn from SOM combined to produce masterpieces such as The Sears Tower, The John Hancock Center and the Inland Steel Building. The legendary Mies van der Rohe made Chicago his home and, with that, modernism was brought to the limelight with great projects like The Federal Center, 860-880 Lake Shore Dr. and The IBM Building. There were many others projects deserving of recognition, such as the great Marina City by Bertrand Goldberg or Lake Point Tower by George Schipporeit. 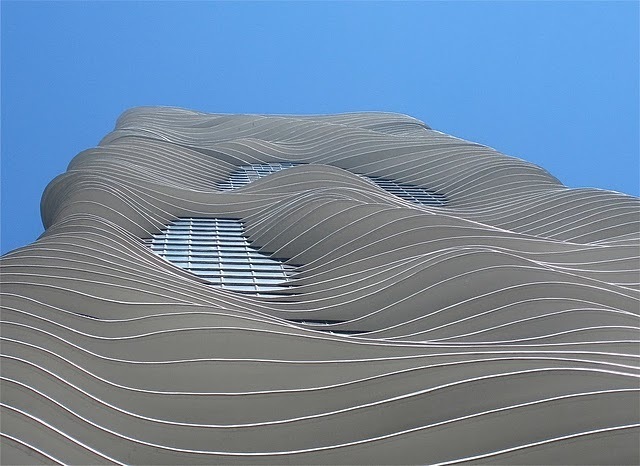 The Aqua Tower (Studio Gang) – residential/hotel: without any previous high-rise experience, Jeanne Gang produced a new landmark for the city. The building starts from the basic modern box form that is broken up by a 9-inch concrete slab that is curvaceous and sensuous, cantilevering beyond the rectangular frame from 4 to 15 feet. There is an interesting duality of rigidity and dynamism that makes the building a very successful aesthetic statement. However, the impact of the duality lessens the further you are to the building since the slabs mesh with the rectangular frame in an indistinguishable and plain and dark glass box. Another great feature includes a massive green roof over the podium that defines the first 3 stories of the building. The roof provides the residents amenities that include a running track, 3 swimming pools, cabanas and plenty of greenery. Structurally, the building simply relies in a concrete core and peripheral columns that allow for the slab to cantilever and for the building to withstand lateral loads. The Trump Tower and Hotel (SOM) – residential/hotel: this is a building that does exactly what is supposed to do. It utilizes the site very efficiently and it was shaped and proportioned to respond to the specific views you would get from and towards the building from different vantage points. Neither structurally nor aesthetically does the building provide uniqueness or inventiveness. In fact, the proportions seem to be off, making the building rather stocky and short, asking to be significantly taller, as it was originally planned. 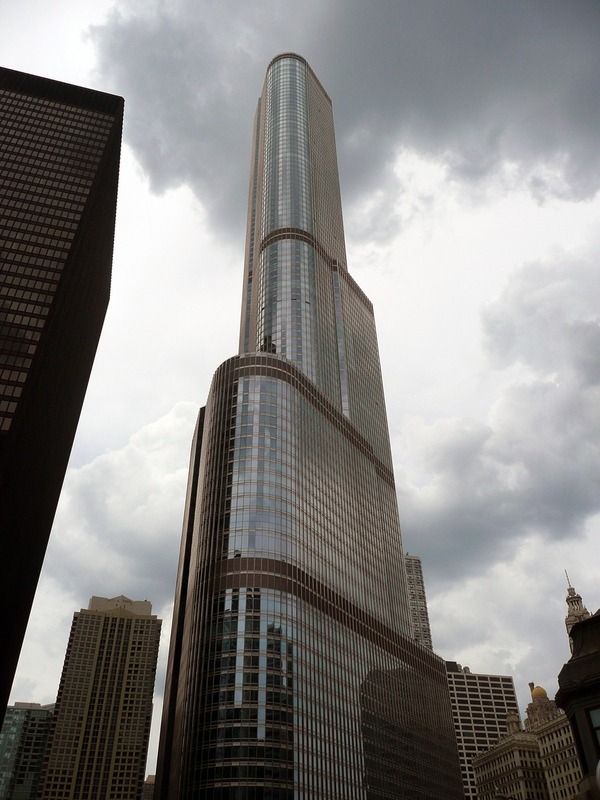 What The Trump Tower sacrifices in height and inventiveness it makes up partly on the quality of the materials used and the attention to detail that a firm like SOM is known for. The Chicago Spire (Calatrava) – residential/hotel/office: this massive project by Spanish architect and engineer Santiago Calatrava fell victim to poor timing and the crash of the housing bubble. The construction had barely gotten started when the economic crisis reached its zenith. All that remains is the immense hole made for the foundation work and the several conceptual iterations that were produced during the approval process. As a result, Calatrava can only be judged in paper, knowing that no one will quite grasp the effect the building might have had once completed. It was, without a doubt, a daring and highly complex building. Calatrava adapted an idea he had already explored and completed in a little-known high-rise in Malmo (Sweden) in one of the most successful efforts of his career. 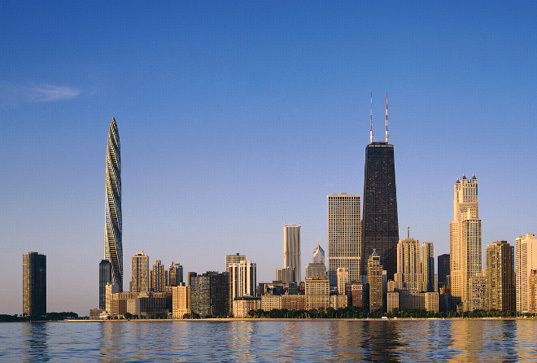 The Chicago Spire was to twist as it got taller, with a rotating floor layout that slowly got smaller as the building rose in height. As it is to be expected with Calatrava, the core of his idea was rooted in a daring engineering form. Calatrava produces works that are objects that stand out by themselves and that often represent a stark contrast to its surroundings. The tower would have been the tallest structure in the United States, with far smaller neighbors in the near vicinity. In order to accomplish height and slenderness, the first conceptual iterations of Calatrava sacrificed floor area, rendering a few upper floors completely unusable. In order to make a more realistic project, Calatrava had to subsequently sacrifice some height (even then the tallest structure in the US) and slenderness. 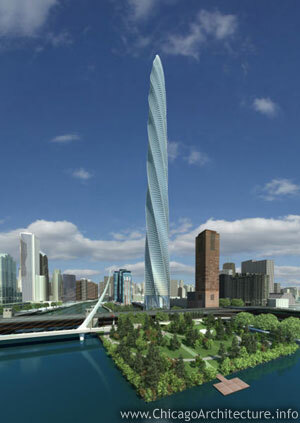 The tower’s twist was also to become more gradual in an effort to make the building cheaper to construct. Aesthetically, these changes made the building less successful, and the rendering produced seem to have been inspired by a phallic object. Despite these interesting entries into the extensive high-rise library of Chicago, the city and most of its American counterparts seem to have fallen behind Asian and European cities that continue to push the boundaries of what is possible structurally and aesthetically.